Gentek 400 series windows provide outstanding features to reduce fuel cost and maximize the energy efficiency of your home. Featuring a 4/1/2” thick fusion welded frame, these windows are not only sturdy and high quality, they are also easy to maintain and upkeep.Quality built Gentek Regency 400 Series Windows include insulating glass technology and fusion welded sashes for improved thermal performance. Westmount Craftsmen offers installation services in the Kitchener, Waterloo, Cambridge and Guelph area. To learn more about the energy efficient windows, feel free to contact us with any questions or read more information below. Looking for Entry Doors click here or Patio Doors click here. Gentek Regency 400 Series Windows are tested and proven to reduce heating and cooling energy consumption, providing quality and durable features. Gentek windows are precision engineered to deliver high energy efficiency and help reduce the consumption of fossil fuels needed for cooling or heating homes. 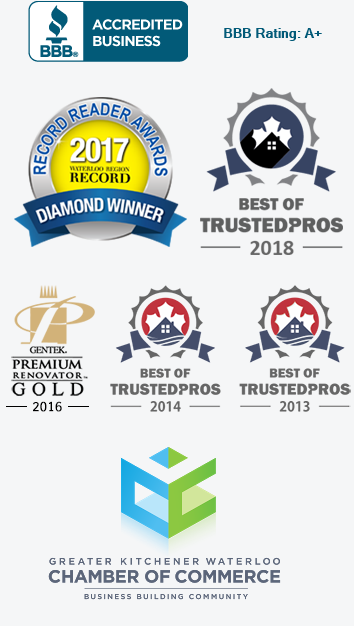 Westmount Craftsmen proudly installs a wide variety of eco-friendly windows made by Gentek to help our environment progressively be cleaner, and to reduce the amount of waste on our planet. Single & Double Hung Windows: Aesthetically stunning and solid build, the single & double hung windows add a traditional feel to your home. These windows are not only energy efficient, they also provide the latest technology and easy upkeep. 1 – Advanced energy-efficient technology is offered by the EnergyPlus glass (soft-coat Low-E and argon gas). 2 – The window provides easy upkeep from inside your home due to the tilt-in bottom sashes only. 3 – The full-width lift rails help to open and close your windows effortlessly and smoothly for many years. 4 – The sturdy fusion-welded frame (4-1/2″) and sash corners adds further structural strength and increases precision in the frame and sash. 5 – These windows include a steel reinforced interlock (larger windows) with two locks and keepers. 6 – The premium frame will not corrode, peel or rust and will never need painting. 7 – The single and double hung provides full-width lift rails for effortless operation. 8 – The advanced warm edge system provides a powerful thermal barrier. The single and double hung window is also double-glazed 7/8″ insulated glass keeping the temperature indoors steady. 9 – For maximum thermal efficiency year-round, the casement windows can include a triple-glazed 1-1/4″ thick insulated glass unit option. 10 – Integrated 3/4″ and 1/2″ wood return. 11 – Included hidden exterior accessory grooves for optional accessories. Slider Windows: Enjoy the beautiful weather year round with these stunning slider windows. They provide a clean and elegant style to any room and the sturdy built ensures smooth and easy horizontal gliding. 2 – Smooth operation, the slider window features two sets of solid brass tandem rollers. 3 – The sturdy fusion-welded frame (4-1/2″) and sash corners adds further structural strength and increases precision in the frame and sash. 4 – Operating sash features two sets of solid brass to ensure smooth operation. 5 – The advanced warm edge system provides a powerful thermal barrier. The single and double hung window is also double-glazed 7/8″ insulated glass keeping the temperature indoors steady. 7 – For maximum thermal efficiency year-round, the casement windows can include a triple-glazed 1-3/8″ thick insulated glass unit option. 8 – Integrated 3/4″ and 1/2″ wood return. 9 – Included hidden exterior accessory grooves for optional accessories. 11 – Full-height pull rail for easy operation. Casement Windows: Durable and elegant windows provide sturdy built mechanism to ensure smooth and easy operation. The casement windows has a casual and simple design, yet very elegant. Casement windows can also be combined with fixed lites to generate a larger window group that provides ventilation. 3 – The window system helps to open and close your windows effortlessly and smoothly for many years. 4 – The sturdy fusion-welded frame and sash corners adds further structural strength and increases precision in the frame and sash. 5 – The premium frame will not corrode, peel or rust and will never need painting. 6 – The casement windows provides heavy-duty operating hardware crank ensures a tight fit for effortless operation. 7 – The advanced warm edge system provides a powerful thermal barrier. The casement window is also double-glazed 7/8″ insulated glass keeping the temperature indoors steady. 8 – For maximum thermal efficiency year-round, the casement windows can include a triple-glazed 1-3/8″ thick insulated glass unit option. 9 – Integrated 3/4″ and 1/2″ wood return. Awning Windows: Westmount Craftsmen is proud to install awning windows, not only are they extremely versatile but they also provide classic design feature and refreshing ventilation. These windows open up and out with a comfortable and easy to use crank. Awning windows can be combined beautifully with architectural windows or picture windows to embrace the outdoors even more by making your window larger. 2 – The sturdy four-point fusion-welded corners and sturdy frame adds further structural strength and increases precision in the frame and sash. 3 – The awning windows provides heavy-duty operating hardware crank ensures a tight fit for effortless operation. 4 – The advanced warm edge system provides a powerful thermal barrier. The single and double hung window is also double-glazed 7/8″ insulated glass keeping the temperature indoors steady. 6 – For maximum thermal efficiency year-round, the casement windows can include a triple-glazed 1-3/8″ thick insulated glass unit option. 7 – Integrated 3/4″ and 1/2″ wood return. 8 – Included hidden exterior accessory grooves for optional accessories. Picture & Architectural Shape Windows: Enjoy natural light pouring through your home with these stunning picture & architectural shape windows. Add character to your space with these stunning and high quality crafted windows. 2 – The sturdy four-point fusion-welded corners and sturdy frame adds further structural strength and increases precision in the frame. 3 – The advanced warm edge system provides a powerful thermal barrier. The single and double hung window is also double-glazed 7/8″ insulated glass keeping the temperature indoors steady. 4 – The premium frame will not corrode, peel or rust and will never need painting. 5 – For maximum thermal efficiency year-round, the casement windows can include a triple-glazed 1-3/8″ thick insulated glass unit option. 6 – Integrated 3/4″ and 1/2″ wood return. 7 – Included hidden exterior accessory grooves for optional accessories. Westmount Craftsmen installs a large selection of glass, grids choices and provided colour options. We offers a wide variety of decorative choices, add your personal touch by customizing your windows. Contact us to know more about the customization process and what other accessories we provide. Elegant and unique space windows add a ton of character to the architectural look of your home. Builts with consideration and case, these stunning windows will completely transform the design of your home, both inside out. They can be used alone or combined with other windows to add more curb appeal, contact us to learn more about your options. Westmount Craftsmen installs an impressive selection of patterns and interior grids. Not only are they inside the insulated glass unit for an smooth and easy cleaning, they also enhance the design of your home by adding a unique touch to your Gentek windows. Contact us to know more about your options and large selection of colours we offer. To add a finished look to your new windows, Westmount Craftsmen installs and offers a large selection of window accessories. From wood jambs to integrated brickmould, these accessories are stunning and add character and elegance to any window.